"My weekly exercise classes with Mags are my favourite time of the week! I love how the exercise sessions change from week to week and focus on our much needed pelvic floor. Perhaps more importantly the sessions give me a little bit of much needed "me time" whilst my sons are being looked after by the AMAZING nannies. As a GP I very much appreciate the importance of restrengthening the pelvic floor post-bub and I will no doubt be recommending Mums Going Strong Fitness in the future." "I have been training with Mags for 8 months now and she is awesome! I'm so happy I found her mums fitness group, her sessions are the perfect fit for me. Since I started training with Mags I've lost weight, I feel fit again, I train smarter and I've learnt so much about health and fitness. I would recommend any new mum out there to train with Mags. Her sessions are so much fun! She is supportive, positive, professional and encouraging. Plus its a fantastic way to meet other mums. She is not only a fitness trainer but she is also passionate about womens health and helping each individual reach their goals." "I have been training with Mags for about six months. I started going to the park sessions which were great as the nannies could look after my baby and I could get a break and some exercise. Now I do a combination of personal training at home and group training to fit in with my bubs sleeps and being back at work. It's so hard to fit in exercise with a baby and Mags offers such flexibility that one really has no excuses. I love working out with Mags as it is not only a great workout where she pushes you till you're a sweaty mess on the floor but we are always in fits of laughter. As Mags is a mum, she remembers and understands the trials and tribulations of navigating motherhood through the early days and as the months and years progress. Since having a baby my body is different and felt foreign. Diet and exercise regimes pre-baby have not equalled the same results post baby. I have noticed significant changes in my fitness and strength since training with Mags that make it easier for me to tackle life with an active 11month old boy. " "I found the pelvic floor and core restore program a great first step back into exercise following pregnancy and birth. It was difficult to find an exercise program tailored towards reintroducing your body to exercise post birth, however this was perfect. Magdalena, you have a wealth of knowledge of the pelvic floor and core and the changes that occur during pregnancy and ensure that all exercises are suitable and safe. I have learnt so much about my body and how to care for myself through this program. Thank you so much for your help through out, you are amazing!" "Mag's fitness classes are great! They have been a life saver for me to get some much needed "me" time & I feel so much fitter & stronger. The social aspect & camaraderie with the other Mums is a lovely bonus too. The nannys are lovely & so great with the kids. I'm starting block 2 & hope to continue on as long as is possible. " "Just wanted to let you know how much I've been enjoying training with you! I've done lots of PT in the past and hated it, but I'm finding that I really like your style and I'm actually enjoying it and am seeing some great results in such a short time! " "After my six week check up my doctor told me I was fine to go back to regular exercise. A friend in my mothers group recommended Magdalena and she not only got me back into shape but also shared with me with valuable knowledge that every mum should have post birth. I went and saw a Women's Health Physio that she recommended to get a further check up and it turned out that I wasn't just able to go back to exercising as my doctor said. I started with some one on one sessions and she came to my apartment and gave me simple exercises that I could do at home, which is great when you have a newborn. She also made me feel very comfortable and I found her to be very warm and friendly. I also liked that she has a young son and had actually gone through what I was experiencing, unlike other trainers in the area. Within a couple weeks I was back in shape and my Physio said that Magdalena had done great work. I am now doing her group sessions as I love working out with her and also now am aware of how important the right type of exercising is post birth. I look forward to my group session each week! " "I started personal training 1:1 with Mags once my OBGyn gave me the all clear at my 6 week post natal check up. I did a few weeks of private seasons at home whilst bub slept which was a great way to get back into exercising without the stress of getting organised to go to the gym with a baby who could wake up at any time and need a feed. Mags tailored the sessions to me and was able to push me within the restrains of post natal training with focus on PF and correct core engagement. The sessions were challenging but realistic and helped rebuild my strength and endurance. I've now moved to the Mums outdoor training and enjoy the group environment. The sessions are non stops and definitely get the heart rate up! The nannies are fabulous and I can train knowing bub is in safe hands. Mums Going Strong Fitness has been a great experience and I would strongly recommend Mags to any mums because as a mum herself she is able to leverage her personal experience and ensure you're training smarter and won't regret misinformed choices in a few months. She works closely with women's health physios, chiros and other health care professionals in the area to provide informed materials and options for your overall wellbeing. " "I started group training with Magdalena about 4 months after having my daughter. I was keen to start exercising again but unaware of the limitations I was facing from my body until I completed her recommended physio check up. Mags creates a highly supportive environment and is incredibly focused on being across everyone's personal levels to ensure no one is pushed before their body is ready. She provides structured feedback tailored to each individual's specific needs. Since starting the training I feel so much stronger, more motivated and healthier than before. I look forward to the sessions each week and would highly recommend her training to any mums hoping to get back in to an effective post-partum exercise routine. " "I joined Mums Going Strong Fitness after my second child, I was a member of a gym but finding it hard to attend regularly and unsure if I was doing more damage to my pelvic floor than good! I was pretty good with my diet at this point but kept finding excuses not to exercise. I was looking for something with a bit more accountability, that would push me physically and I would enjoy doing. MGS Fitness ticked all these boxes for me, Magdalena our trainer is really approachable, she ensures all exercises are done correctly so we aren't wasting energy, the workouts are different each time so you don't get bored and its great to be training with other mums in such a supportive environment regardless of your fitness level. I can honestly say I look forward to my weekly training sessions, I feel great for the rest of the day and I hope to do even more next term." 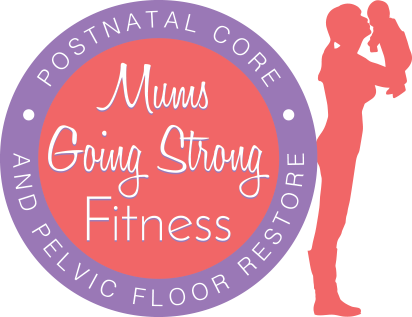 "I have loved my first block of training at "Mum's going strong fitness" No session is the same and Magdalena always ensures there is a focus each session on core and pelvic floor which I have found invaluable. I can already feel my fitness & energy levels improving & with nutrition and recipe advice regularly updated on Facebook the whole program is very integrated to help me on my way to be fitter and healthier than I was before my baby came along." "The Mums Going Strong sessions with Mags are fantastic! She designs weekly programs that provide a full body workout, leaving you feeling stronger, fitter, healthier and excited about exercising again. Mags is a wonderful trainer who motivates you throughout the sessions, even when you feel like you can't go on anymore! She has an excellent knowledge of how to build up your pelvic floor muscles and targets this in her one hour programs. It is great being able to train outdoors with a lovely group of mums, as well as having nanny care while you workout. I would highly recommend doing a trial session!" "My core feels much stronger for having completed the program. The sessions were fun and informative. I always felt better having done the workouts not only for the exercise, but also because it gave me a chance to do something for myself and to talk with the other ladies. The video links that you included in the emails were really helpful when doing my homework in between sessions. Weekly challenges and Facebook group were great to keep me motivated and to expand my focus from my physical health to a more holistic health approach. Thanks again for all your encouragement and motivation over the last 6 weeks." "I not only learnt about what exercises to do post birth but I also learnt about nutrition and some very surprising facts particularly relating to sugar. The course made me look at, not only what I eat, but what I feed my family. With two young kids I'm always worried that I don't give them the right foods - I was easily reaching for the snack bar packs which you buy from the baby isle in the supermarket and giving them to my toddler but, as part of the lessons I learnt in the course, I started checking nutritional facts on the side of boxes and soon realised how unhealthy these convenient snacks are since they are full of sugar. I found the recipe's you posted on Face Book really helpful and have been baking snacks for my son every week in preparation for weekends and late afternoon snacks after daycare. Yes, it isn't as convenient but I know exactly what my son is eating because I made it. As an instructor you are so relaxed and it seems as though you have years of experience teaching mummies. It was nice not to run to pick my baby up when he grizzled during the class because you were there to give them a cuddle while still showing us mummies the exercises - sometimes even holding two bubs at a time! I wouldn't change anything about the course." "I found the Course really helpful and would recommend it to all new mums. In particular I found the individual assessment and feedback really useful, especially in relation to activating pelvic floor in day-to-day activities and modifying exercises and correcting position during pump class. I was not aware of my abdominal separation so I am glad I became aware of this and modified my exercise accordingly. I also enjoyed the weekly challenges related to diet etc. I think they complemented the exercise program well to have a holistic approach to looking after mums health and fitness post pregnancy." "You are absolutely the right person to help me exercise again after having a baby. As soon as you explained how we don't really know how our body feels after birth, it really hit me how relatable and awesome you were. Being able to bring my baby to the sessions was also very important to me and you made it very baby friendly. All the food recommendations and exercises were great and I couldn't recommend you highly enough." "Thank you so much for all the support and guidance you've given me to achieve my post baby fitness goals. I've really enjoyed our training together and already feel a lot healthier and stronger. As a new mum I wanted to regain my pre pregnant body straight away, but found it difficult to find someone with the right skills to train me and someone I could trust (who understood my postnatal needs). Your history and passion for post baby health and nutrition made me feel confident and at ease straight away. Listening to your own personal journey through motherhood and post natal exercise I knew you were the right person I needed. I found each weekly session to be very comprehensive. Focusing on my breathing and using correct technique through the exercises. I feel much stronger through my core and pelvic floor. The advice you gave regarding my nutrition has also seen me lose baby weight and have more energy throughout the day. With your fun, positive and caring attitude I found I had no excuses following your easy week to week exercise program. I found the program was always consistent with my own personal fitness level and within weeks I not only felt better but could see results. "Training with Magdalena has been great. Her explanations and understanding of post partum recovery was really helpful to understand where I was going wrong !"